Are you candidates for West Bengal Constable & Sub- Inspector Exam? Then this post is very useful to you. here you can get model question set. Most of the students search on Internet West Bengal Police Constable & Sub-Inspector model Question Paper. Practice set helps you to better practice. We regularly upload quality Study materials for various competitive Exam. Today GK Solve share West Bengal Constable & Sub-Inspector Exam model Question Paper download link. If you are candidates for WB Constable exam, then this pdf is most Important for you. 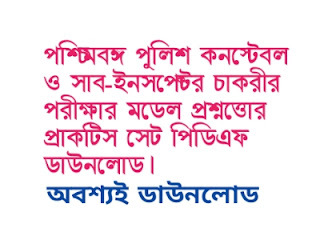 Also, West Bengal Sub-Inspector Exam Model Practice set available here. 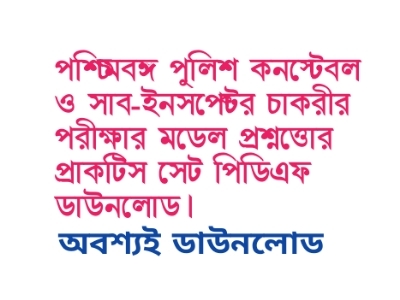 You must download this PDF for better practice.West Bengal Police board announced this month recruitment of West Bengal Constable & Sub-Inspector. So you need study materials for practice. West Bengal Constable & Sub- Inspector Model Question - Answer set pdf below here. Hope, this post really helpful to you.